3 Awesome Marketing Products that got the Mobile Electronics Industry Talking in 2017! Alpine’s Electronics’ new $1500 USD Grizzly cooler, is it a joke or marketing genius? Many in the industry have laughed at this item, including me. But then I was thinking about other manufacturers that have built “statement” pieces or pure marketing items for 2017. Let’s compare three great examples that “got the industry talking” in 2017. By most accounts, a hard sell to a consumer, but an absolutely great conversation piece! It’s sixteen inches of mounting depth isn’t practical for today’s vehicles but this piece wasn’t made for “practical” applications. This subwoofer is a great example of a statement piece for dealer’s showrooms and extreme demo vehicles. At CES, Rockford Fosgate stated they have over two dozen presold to dealers, I think the marketing idea on this piece was, “we still and always will make badass subwoofers”! With Alpine’s corporate direction into the outdoor aftermarket “Jeep” market, what better piece to take on the road! 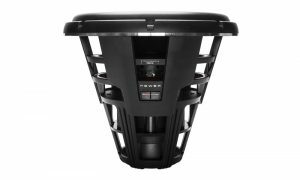 If we compare Rockford’s Woofer example to marketing to Alpine’s cooler, the subwoofer will mostly remain at a dealer’s showroom, while the cooler can be taken to outdoor events, displayed easily and cater to other demographics than tradition car audio enthusiasts. You must admit; these two examples are exact opposite ideas in marketing. 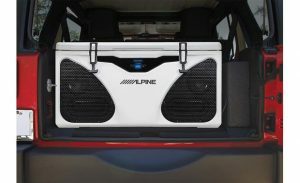 Alpine is using the functionally of a product and the cross-promotion marketing with a cooler company, a cart company and power supply company to start conversations about their product. For more details on this product, I will post a direct link. 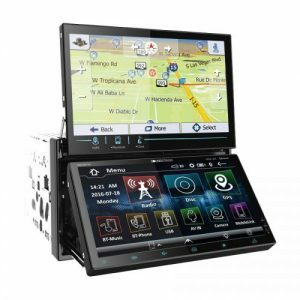 Soundstream’s dual-screen double-din radio says, “Let’s try to rethink the double din radio”. Besides different GUIs or screen clarity, double din radios have not changed much in the past ten years. But the VRN-DD7HB makes us rethink the common double din radio. Two screens have never been done before, that we can remember. If we called Soundstream a “B” brand in head units, only because it’s not Pioneer, Alpine, Clarion, Sony or Kenwood, but this “B” brand became the talk of the 2017 Consumer Electronics Show in Las Vegas, NV with this piece. Will customer love this unit, only time will tell? Bravo Soundstream, great marketing idea! These three products could not be different in every way, but they do have one thing in common – they have got people talking. Isn’t that marketing? I admit to being closeminded on these products in the beginning, but then I really started to appreciate the marketing genius behind the products from these manufacturers. You might have noticed us posting old car audio ads on our Facebook page. For example, the “Outlaw” amplifier from Phoenix Gold (here’s a direct link to the ad). These items were marketing genius many years ago, creating excitement and industry “chatter” over these amplifiers. Even over twenty years later, people still collect and wish they owned one of these amplifiers. Phoenix Gold, really understood the idea of creating a desire for their product, creating conversations and marketing their other products with the “Outlaw” series of amplifiers. It is great to see manufacturers continuing in this direction of creating exciting products that get their message out to the public. Have things really changed? In an industry that hasn’t seen too much new technology, these three products have really created the same excitement in 2017.